Is sustainable consumption relevant to your organizational goals? Is your organization in a position to affect change industry wide? How might you lead by example? For a non-profit like NWEI that develops sustainability education course books intended to Inspire people to take responsibility for Earth, these questions might seem a bit redundant. However, these are only a few of the many questions that helped stimulate discussion among the NWEI staff every Wednesday during the lunch hour, over the course of five weeks, as we participated in our own newest course Sustainable Systems at Work. It was truly inspiring to see an organization whose entire existence is based upon the concept of sustainability, walk away with so many great initiatives. Imagine what results would come from an organization taking the course that has yet to fully embrace the importance of sustainability! Creating a comprehensive power-saving strategy implemented among staff and office, as well as delivering suggestions for the entire building. Initiating two NWEI discussion courses within our building and among tenants, with the aspiration of creating an Olympic Mills Building Green Team in the future. Evaluating all forms of natural and human capital necessary to run NWEI, and assessed how to responsibly account for those resources. One example: we made plans to plant trees on a regular basis, as a staff, in order to offset the paper needed to produce our course books, and also simply to have a fun outing as a staff! Integrating a carbon footprint calculator into our website, with the future plan of evaluating the average impact of our course books (from the tree to your doorstep) in hopes of encouraging participants to purchase offsets for that footprint. As a new member to the NWEI team, I was at first surprised by the concept of taking our own course, and then I quickly became thrilled by the idea. The discussion course got our wonderful, intelligent staff talking, and most importantly, helped to further develop our action plan in order to advance organizational change towards a more sustainable future. What better way to lead than by example, right? Be the change! If you needed another reason to remember your reusable bags when you head to the grocery store, Whole Foods Market offers the opportunity to donate your bag refund to nonprofits through the “Change for Change” program. NWEI is currently a featured organization for the “Change for Change” program at the Northwest Portland Whole Foods Market. For three months NWEI will receive a nickel per bag from customers who re-use their bags–and those nickels can add up! It’s an easy way to support your favorite organizations and one more reason to remember those bags! 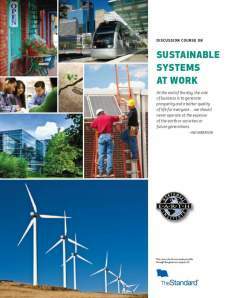 As many of you know, NWEI released its first organizational discussion course, Sustainable Systems at Work (SSW) last summer. The course was created in response to requests from the businesses we’ve worked with, who wanted a course that was tailored to sustainability in the business context. In a nutshell, the goal of this course is to engage employees in organizational sustainability initiatives. Now here comes the question of the chicken or the egg: Did Sustainable Systems at Work help move the concept of employee engagement to the forefront of organizational priorities, or did we create SSW as a response to the need for employee engagement? Alright, as much as I would like to think that NWEI ushered in the influx of employee engagement conversations, I know that the idea has been around for a while. Nonetheless, I can say that ever since we launched Sustainable Systems at Work, I have been seeing articles everywhere singing the praises of employee engagement. However, I noticed that although these articles make a good case for why employee engagement was a good thing for the Triple Bottom Line, there was a lack of tools, resources, or ideas on how to actually do so. I read quite a few articles that focused on the topic, but instead of continuing to feel ignored, I decided to be proactive. I contacted Deborah Fleischer, President of Green Impact, who also writes for Triple Pundit (which often includes several articles about employee engagement). Deborah was interested in learning about Sustainable Systems at Work, and ended up posting an article about the course, employee engagement, and our work with Intel. Click here to check out her story. Now I’m not trying to say that yelling at your computer screen is an ineffective way to get your message heard; but sometimes it helps to be more proactive. And that is what employee engagement is all about, right? NWEI Discovers a New Sense of Place! 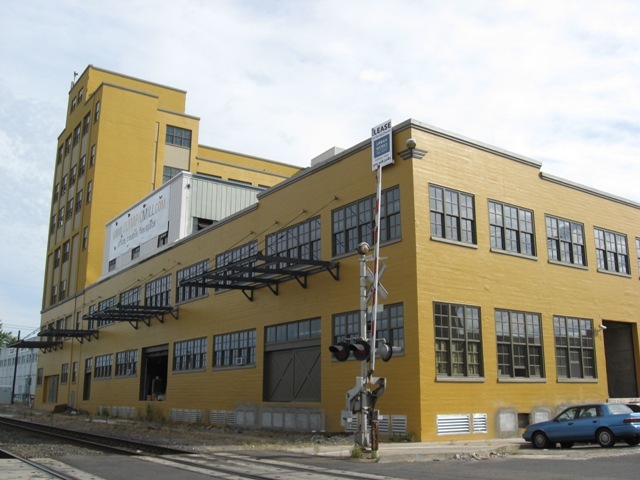 In early December the NWEI staff said goodbye to its downtown location and moved across the river to the renovated Olympic Mills office building in inner Southeast Portland. While we’ll miss the view of Mt. Hood and our favorite food carts, we’re excited about our new location. Once a flour mill producing Bisquick and Wheaties, the 1920s building has been renovated into a bright, creative, mixed-use space that includes offices, a restaurant and a coffee shop. The high ceilings and exposed pipes and beams create an open and spacious feeling in our office, despite it being smaller than our old space. In many ways, this renovated old mill building reflects NWEI’s own efforts to grow and adapt to a changing world while maintaining a solid foundation. The mix of old and new suggest a sense of history and possibility. The process of moving itself provided us with an opportunity to look back at where we came from and as we go forward, to think creatively about our place in the world. If you are in the neighborhood, stop in and say hi! First green general store chain, Seven Planet, recently opened its doors to sustainable consumers in Portland, OR. Located downtown, the shop offers products in seven different silos: apparel, energy, food, health, household, shelter, and travel. Amongst the racks of clothing and shelves of goods is a very comfortable and communal area to spend time, filled with work from local artists. In this area, locals will gather every two weeks to engage in and discuss food systems and the effect agriculture has on culture, society, and ecological systems. Seven Planet is planning on offering Menu for the Future to the community, and is hoping to continue offering NWEI discussion courses to those interested in participating. In the near future, NWEI discussion materials will be available for purchase at Seven Planet, so stay tuned! What will be your menu for the future? Get in on the discussion as we get people talking about what, and how, they eat. This 6-session course will engage participants in thoughtful discussion about how to eat more sustainably. Come to Seven Planet General Store for an info session about how to get involved! Alright! An opportunity for the public, already, and the blog is still in its wobbler phase!! (In case you don’t know, a wobbler is a child stuck in the grey space, torn between toddler and upright walking stages.) Quick, get Grandma on the phone! Hooray! Thanks, and we’ll see you there. ur ideas about sustainability and discover how making small changes can make a big difference!